Renesas Electronics and Airbiquity have announced the release of a a secure, high performance automotive solution with Over-The-Air (OTA) capabilities, targeting Advanced Driver Assistance Systems (ADAS), vehicle-to-everything (V2X), and automated driving applications of the future. To prepare for the upcoming autonomous driving era, the two companies are integrating Airbiquity’s OTAmatic cloud-based OTA software and data management service delivery solution on Renesas’ high performance, low power R-Car H3 automotive computing platform. The combined solution based on the R-Car H3 System-on-Chip (SoC) is compliant with the ISO 26262 safety functionality (FuSa) standard, brings a powerful, efficient, and secure automotive computing platform with highly targeted and scalable on-demand OTA software update and data management capabilities. An increasing dependency on software, Electronic Control Units (ECUs), sensors, and microprocessors (MCUs) to power emerging autonomous vehicle systems and features - combined with the intricacy and complexity of securely managing OTA software updates and data collection for millions of vehicles simultaneously - has spurred a demand for an automotive-grade solution comprised of high-performance telematics processors that is backed by a robust OTA software update and data management solution. “It’s clear that future connected vehicles will require a combination of sophisticated on-board processing power and the ability to securely perform software updates remotely,” said John Tuttle, Vice President of Engineering at Airbiquity. 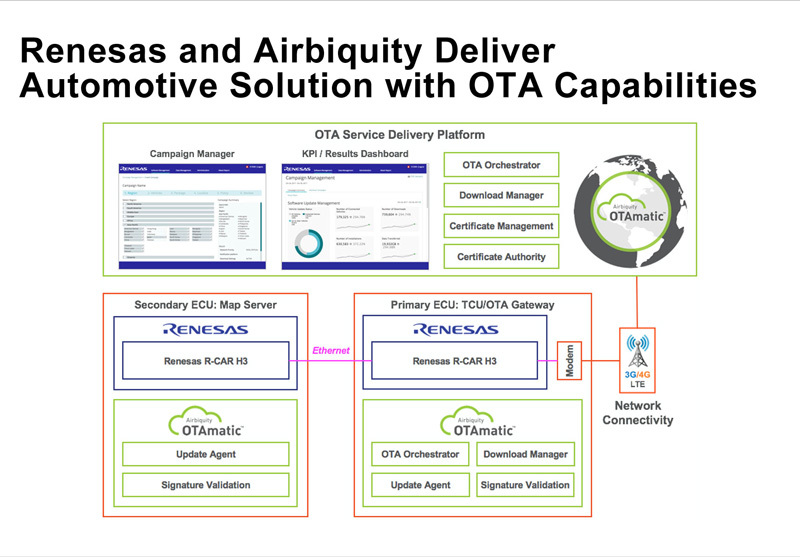 “Airbiquity OTA service delivery is a perfect complement to Renesas R-Car SoC processor technology for the autonomous driving era,” Craig Johnson, Director, Automotive Advanced Systems Innovation Department, Automotive System Business Division at Renesas. Airbiquity OTAmatic securely orchestrates and automates multi-ECU OTA campaigns with policy-driven dependency, rollback, and recovery; certification, authentication, and encryption; dynamic data collection and upgradable analytics; intelligent network selection, data caching, and transfer; customised consumer notifications, prompts, and consent; and campaign creation, approval, reporting, and administration. OTAmatic can also be deployed via Airbiquity’s Choreo cloud, leading public clouds like Microsoft Azure or Amazon Web Services, or on-premise data centers to best meet automaker and supplier management, security, and business needs. The Renesas R-Car H3 provides advanced cognitive computing capabilities and enhanced computing performance that can accurately process large volumes of information from vehicle sensors in real time, making it suitable for driving safety support systems. The R-Car H3 is part of Renesas’ open, innovative, and trusted Renesas autonomy Platform for ADAS and automated driving that delivers total end-to-end solutions scaling from cloud to sensing and vehicle control. With Renesas autonomy, Renesas aims to contribute to a safe and secure society in the autonomous driving era.